Another week, another Saturday full of drinking experiments. Ever since our recent mint julep experiment, we’ve been wanting to try a few new variations. Cilantro is a delicious and easily-available green herb, and also one of my favorites, so it was probably inevitable that it would find its way into a drink eventually. My original intuition said gin, as I have never met a green herb that did not go well with gin. In the planning stages it was to stop there; Gin, simple sugar, cilantro, cracked ice. The standard method for making a mint julep. At game time, however, I realized that gin and cilantro was going to taste a little flat, and I realized that something in cilantro was calling out for tequila. We ended up making two variations on the theme, one with Gin, sweetened with green charteuse, and one with tequila, sweetened with agave syrup. Unlike with mint, which needs to be treated delicately, cilantro takes a little more convincing before it gives up its flavors. You’ll want to build this one in the glass; start with your sweetener and a few sprigs of cilantro. Using your muddler, rough up that cilantro and show it who’s boss. Once it’s nice and smashed, add crushed ice, and then slowly pour the base spirit over the crushed ice, and give it a quick stir. 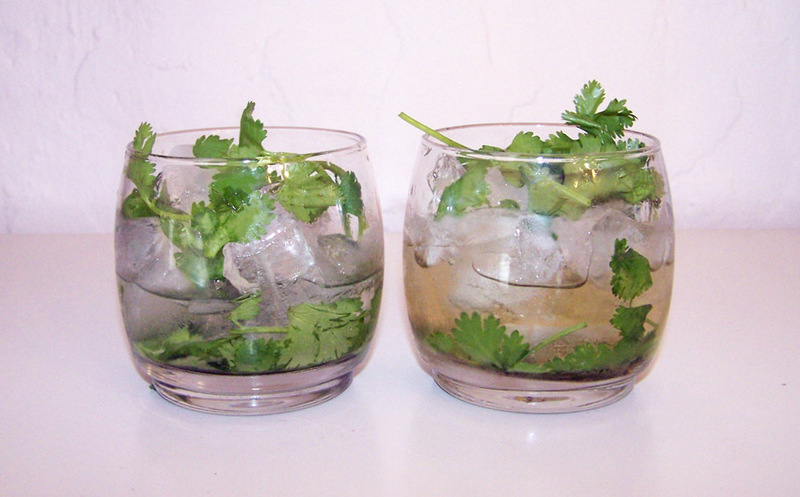 Garnish by placing more fresh cilantro on top of the crushed ice. This was the first time that I’ve seen gin fail to play nice with a green herb. Gin was there, cilantro was there, but there was no harmony, no reason to continue. The green Chartreuse fit nicely in the drink, but I really can’t advise that you make a gin cilantro julep. Tequila, on the other hand, has a wonderful vegetal flavor that matches beautifully with the similar notes in fresh cilantro. Place cilantro and agave nectar in a glass and muddle vigorously. Add crushed ice and slowly pour the tequila over it. Garnish with more fresh cilantro. This is exactly what you want with your next Mexican meal. Tacos, nachos, fresh salsa — as long as it’s spicy, it will go with this drink. Happy Monday! Categories: original creations | Tags: alcohol, bartending, booze, cilantro, cocktail, cocktails, drinking, drinks, gin, green chartreuse, herradura, julep, mint julep, mixed drinks, mixology, tequila | Permalink.